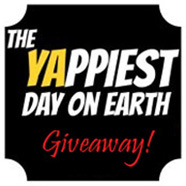 The 8th YAppiest Giveaway! is for The Lost Code, by Kevin Emerson. This book was so amazing that it deserves two (count them, 2) winners! Unfortunately, I only have one signed copy, but both copies are new! And do I have to remind you that they are FREE? I’ll contact you for your addresses, ladies. This is the 8th YAppiest Giveaway! For a chance to win a FREE copy of this book, see the “Here’s How” section below. The rules have changed slightly, so read them carefully. For a complete list of upcoming giveaways, go here. It’s 2086, after the Great Rise, when the oceans rose, the ozone layer disintegrated, the sun turned deadly, and civilization unraveled into a harsh fight for survival. 15 year-old Owen Parker is familiar with hardship. He and his father have subsisted in an underground community called The Hub—beneath the sun-baked wasteland, once part of the United States—for as long as he can remember. Owen’s never been lucky, that is until he wins the coveted Camp Eden summer camp lottery. Out of the thousands of entrants, Owen gets the opportunity to spend an idyllic summer in a world “like it was” before the Great Rise. Camp Eden is located inside the EdenWest BioDome, an oasis of pine trees, cool water, that’s complete with 1950’s rustic summer camp charm. Only the wealthy can afford to live in biodomes, the only habitable environments safe from the sun’s deadly rays. Camp Eden is exclusive, even for those who can afford the price. But Camp Eden isn’t as perfect as it seems. Owen discovers this the hard way. An unfortunate drowning incident in Lake Eden results in weird wounds that appear on his neck. At least Owen thinks their wounds until Lilly, the gorgeous lifeguard, warns him to keep them secret. Owen soon learns that the “wounds” are a biological evolution, and they are the catalyst for his uncovering the secret buried deep beneath the lake. A secret from the distant past that is powerful enough to save the ailing planet. The camp’s location is no coincidence, and sinister happening behind the summer camp facade are proof that the people running Camp Eden have ulterior motives. Owen won his camp scholarship based on his potential for unlocking the mysteries of the ancient civilization. And there are those who will do anything to posses that power. Owen soon realizes that the only way he can save the world is to escape from Camp Eden alive. What if Atlantis was real, and it’s lost technology could save the human race from imminent extinction? 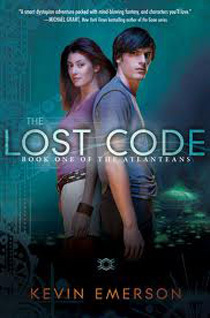 This is the fascinating, and shockingly plausible premise of “The Lost Code” Book One of the Atlanteans. An advanced civilization fell thousands of years ago because of their misuse of power. To prevent the same thing from happening again, they sequestered their knowledge. Knowledge that Owen thinks can save their dying planet. But even if he can unlock the lost code to the secret knowledge of Atlantis, what is the price for exposing that power to the world? Before the beginning, there was the end. And should the time come again when masters seek to bend the terra to their will, then the three shall awaken and save us all. What I love about this book, besides the quirky characters, spot on summer camp scenes, steamy romance, and edge-of-your-seat suspense … is the way Kevin Emerson weaves scientific truths through the story to ground it in reality. The result is a bulletproof suspension of disbelief. I’m super excited that “The Dark Shore” Book Two of the Atlanteans is already available. I’ve ordered my copy and can’t wait to find out what’s in store for Owen and Lilly! 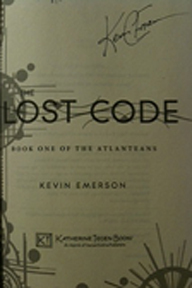 I have a special treat for one lucky winner… a band new copy of The Lost Code, Book One of the Atlanteans, signed by Kevin Emerson! NOTE: The FREE giveaway of a copy of this book is open to residents of the United States only, due to shipping costs. My sincere apologies. Leave a comment on this blog–explaining WHY you want to read this book— by midnight, August 7th (1 entry). I’ll tally the entries and choose a winner, then announce it on this blog on Saturday August 10th. Good luck!